Can someone direct me to some link or provide steps that work when it comes to installing postgresql on Ubuntu? The primary functionality of PostgreSQL is secure storage for data and returning data on requests from other software applications. It is available on Microsoft Windows as well as Linux, whereas, it is the default database system on MacOS. It user base can range from single machines to data warehousing with a large number of concurrent users. PostgresSQL is also abbreviated as "Postgres". PostgreSQL has advanced features such as updatable and materialized views, triggers, foreign keys among others. It also supports functions and stored procedures. Here are the steps that will help you to install PostgreSQL on Ubuntu operating system. 1. Ubuntu Operating system - Ubuntu 14.04 in this case. We use the "apt" command which is part of the Advanced Packaging Tool used to install or remove packages from the operating system. It is also better to update the package repository before installing the package to install the latest and updated version of the software. 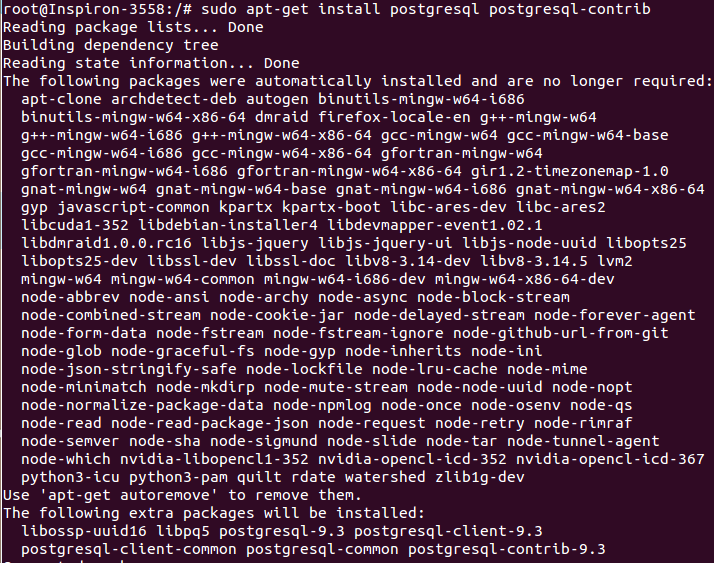 Since PostgreSQL is already a part of the APT package you just have to install the package. You can also install a "contrib" package along with PostgreSQL package if you want additional functionality and features. Please run the following command to install PostgreSQL. Here is a sample output for better understanding.